Since Caribbean Stud poker players are stripped of advantages like bluffing or card counting, their strategies revolve entirely around the moment in the game when they must decide whether to raise or to fold. Beginners can improve their odds with a very simple raise/fold strategy. Because you know the dealer will only play with a hand of A-K or better, you should always fold with less than A-K. Alternately, you should always raise if you have at least a pair. As with other five card poker games, a majority of hands in Caribbean Stud are won with just a pair. 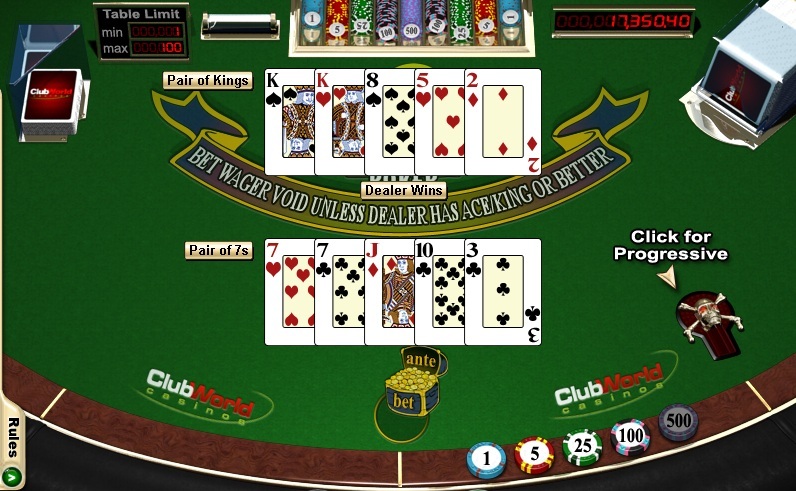 The next level of online Caribbean Stud strategy uses the dealer’s one visible card to determine when you should fold or raise when you do have an A-K hand. There are three basic rules regarding your strategy with an A-K hand. First, if the dealer’s visible card is a Queen or less, and you have the same card in your own hand, then raise. Second, raise if the dealer’s visible card is either an Ace or King only if you have a Queen or Jack in your hand in addition to your own A-K. Finally, raise if you have A-K plus a Queen and if the dealer’s visible card is less than a Queen and also less than your fourth highest card. Playing an always raise strategy gives the house a 16% edge, but playing by the above rules reduces the house edge to just 5%. With optimal strategy the house will usually have about a 5% edge in Caribbean Stud. The progressive Jackpots that can be available for side bets in Caribbean stud often have a large house edge so we recommend doing a little maths before giving this serious consideration. “Collaborating” with other players online to know more about their card holdings can lower the house edge but this is cheating so is not recommended. As with most casino games choosing more player friendly versions of the game and exploiting casino bonuses can increase your odds and arguably also the fun that you have with this game.